To create a new Venue, go to Administration > Venues. This will show you all of the Venues you currently have listed in Kobas. In order to set up a new Venue, click Add A New Venue. Details requires basic contact information about the venue; you also need to set who the venue’s manager is. 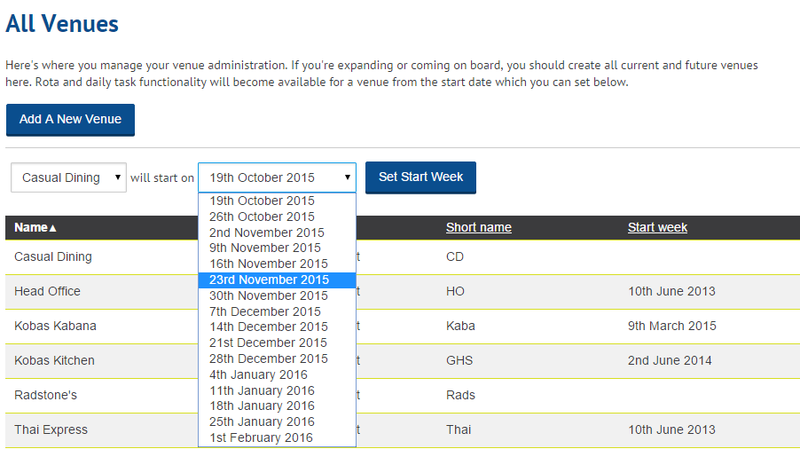 Set what Area your venue is in – select default if this is not relevant to you. Sales & Marketing allows you to select what menu the venue uses, along with setting any images to appear on customer facing screens, and messages to be printed on receipts. The only compulsory step on this tab is what EPoS Menu is to be used. If you do not use Kobas EPoS then set this to “No EPoS,” if this is not already set as the default. 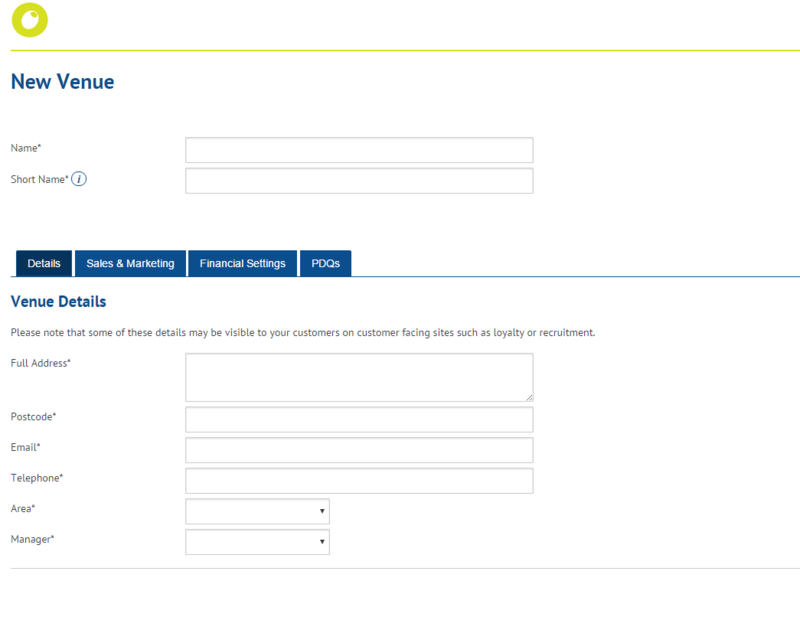 Financial Settings requires information such as the venue’s VAT number, payroll details for Sage and Weekly Bonus Accrual for the venue (if this is not necessary, just enter £0 in this field). 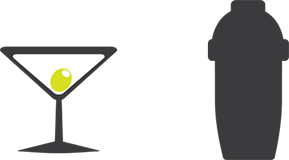 PDQs allows you to set how many unintegrated PDQs are used at your venue and set up any integrated PDQs if necessary. Please note that all fields marked with * are compulsory. Click Save Venue once you have completed these fields. New tabs will then appear for Tills and Printers. These tabs contain the details of what tills and printers are set up in the venue; contact support@kobas.co.uk before adding or changing any details in this section. For more information on your venue’s hardware, please see our Venue Hardware Management guide. Don’t forget to set a Start Week for your venue. This is the date that Rota and Daily Task functionality become available for that venue. You are not able to process orders, stock transfers or stock checks until you have entered a Start Week; however once this has been set, you are able to action these before the chosen date comes into effect. To do this, go to Administration > Venues and choose your Venue and it’s start date from the drop down menu. Press Set Start Week and your venue is set up and ready to use from the date chosen. Please note that you cannot edit the Start Week of a Venue once it has been set. If you accidentally add the wrong start date you need to delete the Venue by clicking the trash icon and set it up again from scratch.